When you're ordering countless soldiers to death on the blood-stained sands of the cruel RTS fields, it's better if those particular guys are total jerks. That way you don't have to endure any crisis of conscious after an artillery strike wipes them all out. Introducing the third faction for Act of Aggression: the Cartel. The Cartel operates as a PMC with some of the most advanced tech in the entire game, which is entirely the opposite of what I figured it would be. I thought the Cartel would field a bunch of drug runners with gold-plated desert eagles, funded entirely by the drug trade. I was not expecting supersoldiers blazing through Marines with laser rifles. Take a look at some of the Cartel's finer points. The Cartel has two tiers you and your friends can explore: Private Military (it is a PMC, after all) for the legal, front line combatants, and Black Ops (once again, it is a PMC) to do all of the shady backstabbing business that PMCs are routinely accused of. Resource management is key here, with buildings requiring vast amounts of Aluminum, and units requiring tons of Cash. Because, you know, you need to pay your Mercenaries. They don't work for spent bullet casings, after all. With the best tech in the game and a focus on resource management, the Cartel is the premier "powerful, but hard to master" faction in Act of Aggression so far. 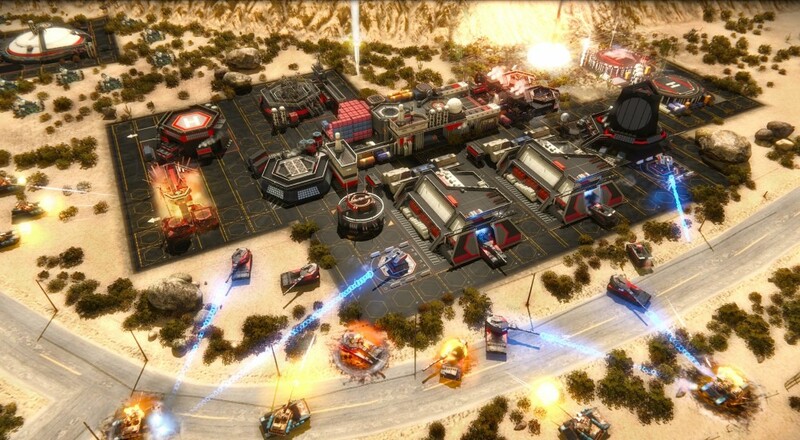 The three player co-op RTS is still in beta, though it premiers for real next month. Its been a while since I've invested in an RTS game, but this one looks quite promising. Mass destruction on an epic scale always has its charm.